Jun | 2017 | "To the Warrior his Arms"
Ordnance badges of the United Kingdom and most present and former Commonwealth countries all trace their origins to the Coat of Arms of the Board of Ordnance. Coming into use in the seventeenth century, but not given royal approval until 1806 when the Arms of the Board of Ordnance was confirmed by a grant from the College of Arms in 1823. Arms: Azure – 3 Field Pieces in pale, or; on a chief, argent, three cannonballs, proper. Crest: Out of a mural crown, argent, a dexter cubit arm, the hand grasping a thunderbolt, winged and inflamed, proper. Supporters: On either side, a Cyclops, in the exterior hand of the dexter a Hammer, and in that of the sinister a pair of Forceps, resting on the shoulder of each respectively, all proper. Motto: ‘sua tela tonanti’ (‘To the Thunderer his weapons’); also more loosely translated as (‘To the warrior his arms’]. Silver/White crown, a right arm grasping a thunderbolt, wings against a flaming background. Supporters: Two cyclops on either the right-hand cyclops holding a hammer, the left-hand cyclops a pair of Forceps, resting on the shoulder of each respectively. The shield with three cannons and three cannonballs is the standard component of the Coat of Arms used on Ordnance cap badges; variations include a riband with either the Corps motto or a descriptor of the corps the insignia belongs to. Early Australian and New Zealand Ordnance badges had annulus surrounding the shield with the name of the respective Corps inside it. Many international variations of Ordnance badges have also had national identifiers affixed to the top of the shield, for example, Canada had a Beaver on their 1903 badge, and New Zealand had the letters NZ on various versions of their badge. The common direction for the cannons is that they always face to the right (Dexter in heraldic terms), the exception is the New Zealand Army Ordnance Corps 1917-23 and South Africa Ordnance Corps 1923-33 badges where the cannons face to the left (Sinister in heraldic terms). Crowns of the reigning Regents were worn. Listed below are examples of some of the various ordnance badges of the United Kingdom, Australia, Canada, India and South Africa. Examples of new Zealand pages can be found at Ordnance Badges of New Zealand 1916-1996. In July 1896 on the recommendation of the War Office, Queen Victoria approved the use of the of the arms of the Board of Ordnance in that the shield, less the crest and the supporters be incorporated into the badge of the Army Ordnance Department and Corps (AOC). The two cap badges were of similar design, differing only in the wording on the scroll and became the parents of all the Imperial, then Commonwealth Ordnance Corps, its pattern of badges would be utilised at some stage by all. Formed as the ‘Australian Army Ordnance Stores Corps’ on 1 July 1902 at the same time as the civilian-staffed Civil Service run ‘Australian Army Ordnance Department’. Entirely placed under military control in 1942 and renamed the ‘Australian Army Ordnance Corps’ and granted Royal status in 1948. The current design of badge with a King’s crown was approved in 1948 but only worn as a collar badge until 1956 when a cap badge with a Queens Crown was introduced which remain in service today. Created as the ‘Ordnance Stores Corps‘ in 1903. It was renamed the ‘Canadian Ordnance Corps‘ in 1907. Granted Royal designation in 1919 it became the ‘Royal Canadian Ordnance Corps‘. Serving until 1968 when the ‘Logistic Branch‘ was formed by combining the ‘Royal Canadian Ordnance Corps’ and the ‘Royal Canadian Army Service Corps‘. Royal Canadian Ordnance Corps, 1961 -1968. The history of the Indian Army Ordnance Corps is traced back to the 15-century formation of the three Presidencies of the East India Company – Bengal, Madras and Bombay, with the formal recognition of the Indian Army Ordnance Corps with the establishment of ‘Board of Ordnance‘ in 1775. With the global disestablishment of the Board in 1855, the Ordnance State Department and Corps were created which was in turn in 1885 organised into the Army Ordnance Department for officer and the Army Ordnance Corps for men. In 1922 the Army Ordnance Department and Army Ordnance Corps were reorganised and renamed ‘Indian Army Ordnance Corps‘. A similar corps badge to the previous badge was introduced but with the scroll bearing the words ‘Indian Army Ordnance Corps’ This badge continued in use until 1954 when the current badge came into use. The IAOC badge should have been discontinued after India became a republic in 1950, but a delay in finalising the new crest led to its continued usage till 1954. With Independence in 1950, the “Indian” prefix was dropped, and the corps is now only known as the ‘Army Ordnance Corps’. On the partition of India and Pakistan in 1947, the Ordnance badge adopted by Pakistan was a modified IAOC badge where the crown was replaced by the Pakistan ensign of Cresent and Star and the word Indian was replaced by Pakistan. Pakistan ensign of a 5 pointed Star. The Ordnance Motto ‘Sua Tela Tonanti’ Translated into English reading ‘To the Thunder his Weapons’ inscribed onto the Riband. A princely state during the British Raj. After India gained independence in 1947, Hyderabad remained independent with the Indian Army taking control of Hyderabad after an invasion codenamed Operation Polo bringing Hyderabad in the Indian union in 1948. Following the British model, the South African Ordnance Department for officers and the South African Ordnance Corps for men was established in 1923. Combining into a single Corps in 1933 and finally reorganising in 1939 when the Technical Services Corps and the ‘Q Services Corps’ was created. Small – about 14mm diameter and used for caps, mess dress waistcoats (vests) and gorgets (red or blue tabs worn by Staff Officers on the collar). Medium – about 19mm diameter and used on pockets and shoulder straps (epaulettes) of most parade uniforms and service dress. Large – about 25mm diameter and used on great-coats and Service Dress jackets. Anodised Royal New Zealand Army Ordnance Corps, 1955- 1996. The dates listed are not the actual dates when the buttons were in service, but the period that the particular iteration of the Ordnance Corps was in existence. It could be assumed that some buttons remained in service after newer versions were introduced. The first New Zealand Ordnance Soldiers wore the standard New Zealand Forces buttons which had been introduced in 1911. There is much photographic evidence of these buttons been worn by both the NZEF NZAOC and the home service NZAOC. The 1911 button would fade from general use as individual brass and later anodised buttons came into use for each different regiment and Corps. The 1911 Button would make a reappearance in widespread use in the late 1990s as all individual corps buttons were wasted out and replaced the modern anodised version of the 1911 button. Gazetted by regulations published on 1 February 1917, the New Zealand Army Ordnance Department (NZAOD) was established as part of the permanent staff of the Defence Forces of New Zealand and consisted only of Officers. Manufactured by Hobson & Sons of London and Extra Super, NZAOD buttons are brass, embossed with an ordnance shield of three cannons, instead of the standard three cannonballs there are two stars in their place with the letters NZ in between. 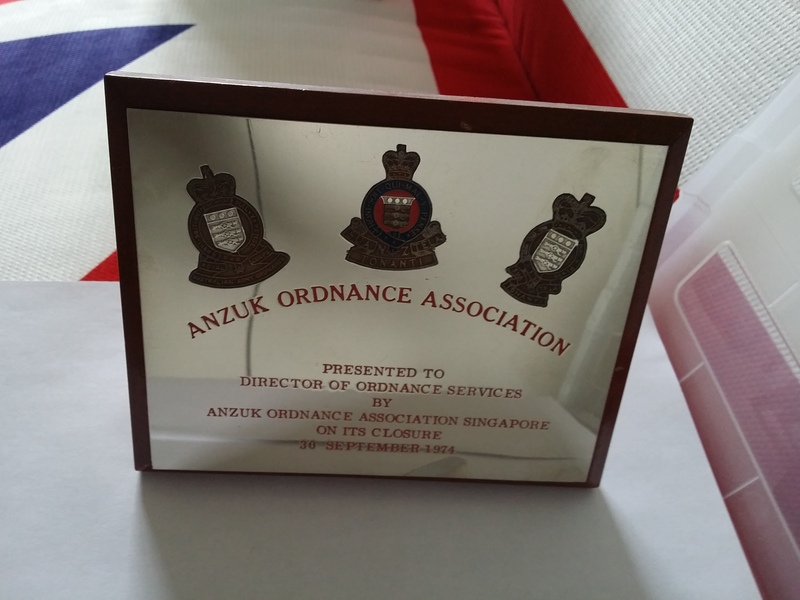 The shield is mounted with a Kings (Tudor) crown and has the words “Army Ordnance Department” circling the shield. The NZAOD was combined with the New Zealand Army Ordnance Corps in 1923, but given that the larger Ligne sizes are relatively common they probably remained in use for several years after 1923. Gazetted by regulations published on 1 February 1917, the New Zealand Army Ordnance Corps (NZAOC) was established as part of the permanent staff of the Defence Forces of New Zealand and consisted of Warrant Officers, Non Commissioned Officers and other ranks. Manufactured by J.R Gaunt & Sons and Firmin, both of London, the NZAOC buttons are brass, embossed with an ordnance shield of three cannons, instead of the standard three cannonballs there are two stars in their place with the letters NZ in between. The shield is mounted with a Kings (Tudor) crown and has the words “Army Ordnance Corps” circling the shield. As with the NZAOD button, the larger Ligne sizes of this are relatively common they probably remained in use for several years after 1923. Manufactured by J.R Gaunt & Sons of London the New Zealand Ordnance Corps buttons are brass and are embossed with an ordnance shield of three cannons, with the standard three cannonballs in the top part of the shield. The shield is mounted with a Kings (Tudor) crown and has the words “New Zealand Ordnance Corps” circling the shield. At present little is known about the history of this pattern button, and it could have been utilised anytime between 1917 and 1955. Manufactured by J.R Gaunt & Sons of London the Royal New Zealand Ordnance Corps buttons are brass and are embossed with a badge similar in pattern to the 1947-55 RNZAOC badge with a Kings (Tudor) crown and NZ between the Garter and Riband. The normal wording “Honi Soit Oui Mal Y Pense” is not included in the Garter but a series of large and small dots have been included where the normal script would be. At present little is known about the history of this pattern button, and it could have been utilised anytime between 1948 and 1955. On the 6th of May 1948, an order was placed on the United Kingdom for 600 anodised aluminium buttons of the pattern illustrated in the following picture. Introduced post-1954 the Aluminium Anodised buttons were manufactured by a variety of manufactures including Gaunt and Firmin and would remain in service until the disbandment of the RNZAOC in 1996. The button has the badge of the RNZAOC, with the St Edwards Crown embossed onto the button. Compared to the brass buttons of earlier times they are unremarkable and in my opinion cheaper looking. Located on the rear of the button, manufacturer marks identify the various button manufactures that produced buttons for the NZ Army over the last 100 years, of which some examples are shown below.